Whether we know it or not, whether it’s spiritually correct to speak in this way or not, Humanity is being engaged in an Interdimensional War. It’s a full-on assault of our sense and sensibilities, designed to shut people down from their higher dimensional awareness and interconnectivity with the divine. It’s an intervention which has been around on Earth for thousands of years, creating a system of control which has ridden rough shod over the natural evolutionary path of the planet. It's almost completely taken over. Almost. Benevolence is never going to let that happen! 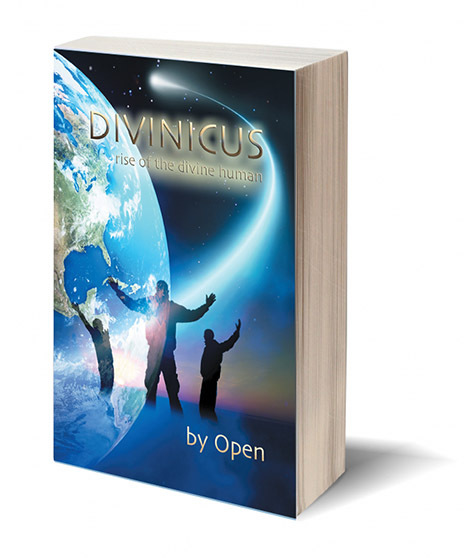 Divinicus is a true story. It tells the rollercoaster ride of coming into this existence as a walk-in, by sacred agreement, through the events of a life threatening car crash. Then being taken in hand by benevolence on an interdimensional journey of rediscovery. From the deserts of Arizona, to the plains of South Africa; from the Garden of Eden to the Big Apple of America; from Ancient Lemuria to the Legendary Atlantis. I share my direct personal experiences of rediscovery. The story alone can touch and shift your consciousness profoundly... And we're carrying the message of the book out around the world with interactive self-realisation workshops - a World Tour of 9 Countries in 9 Weeks - beginning with the book launch event in Glastonbury on September 1st. It's timed to support vital Earth shifts we feel now taking place in the field: designed to restore harmony with the universe; to help humanity truly break free of the intervention, release past life karma, activate his spirit light body, and ascend into the Higher Paradigm. It's all about reclaiming our Original Humanity, going back to the future, back to the divine being Divinicus. Come join the World Tour and if you can't meet me in person, then tune in through the ether and feel the energy. "Can you hear her calling from the depths of your soul?" Rise of the Divine Human from Openhand on Vimeo. Yes, the book is coinciding with strong shifts in the energy field. I can sense a roller coaster ride coming! It's nice to know we're all supporting each other. Hi Open , i can allready feel some shifts too in the field going on . I won't be tonight in Glastonbury for the book launch but i am very honored to be part of the workshop next week-end . It feels like a new chapter into the depths of the challenges preparing Humanity for a deep cleansing . I will be Present with u tonight from afar . My book has just arrived in the post - exciting. It looks great, well done to Trinity on such an attractive and vibrant cover. I've begun reading the first couple of chapters and it feels very powerful and engaging, very much looking forward to reading more. I sense it will be very insightful and beneficial. I ordered the e-book yesterday... It happened to be Labor Day here in the US which ironically is a day many people do not work... Including my husband (so he took the kids out) and I had a huge chunk of time to read and couldn't put it down until my eyes were closing late last night =)! It is an incredibly powerful and gripping journey... The likes of a Hollywood movie!! I feel so grateful for your courage, strength, sensitivity, open heart, and willingness to walk forward where most would turn and run and to just be here at this time and shine the light so that we may learn to fully shine as well! Thank you for this beautiful gift!! Last night was surely exciting- the big kickoff! Can't wait to see you both in florida!! The launch was fantastic - more than any expectation we might have had. We had 'old' Openhanders join us, and plenty of new ones. The room was packed to the rafters - we literally thought we might bring the ceiling down! The build up for us was in itself a real rollercoaster - the universe pushed us to the limit, with every ounce of commitment necessary from both myself and Trin. We thought we had the book produced and finished a couple of weeks prior to the launch - plenty of time to take a much needed holiday. So we headed off down to the coasts of Cornwall, camping for a week. It happened to be the same stretch of coast that Chris experienced his Gateway 2 realignment - with the moving kestrel story. And of course, what should be the first bird that we see there, hovering above the coastal cliffs? Yes, the kestrel in all his glory. So half way through the holiday, it kicked off some deep processes for me - plenty of astral travelling. It caused me to explore the whole nature of so-called 'Mother Nature' - things we kind of take for granted such as 'survival of the fittest', 'predator and prey', 'dog-eat-dog'. Is that actually natural? Gaia 'spoke' to me strongly; not in words but through signs and synchronicity - something to resonate deep in the core of you. I realised this 'survival of the fittest syndrome' was merely a facet of her karma - that she'd created this 'consensus reality' here on Earth as an exploration of the so-called 'raptor consciousness'. And I knew already that it wasn't an aspect of the 5th Dimensional New Paradigm. Then is dawned on me: Gaia doesn't need this anymore. And when she completes the Ascension, she no longer needs to come back. In other words, this reality here in the 3D will close down over time as her energies shift into the Higher Paradigm. And she even showed me how it is to be done, how it is being done right now, and when it's likely to be complete. But for now, I'll save those gems for the book! As I made these realisations, a dance took place between me and the kestrel through the rest of our holiday - popping up here and there, hovering overhead. It's a superlative creature, and I was deeply saddened to think such a being would not be in the Fifth Density - but then I also realised something very important: it's consciousness would ascend and take on a new form there. So with tears of joy, I waved goodby to my old friend. What it meant was, that when we returned, I had to redraft three chapters of the book (the latter ones), with less than a week to go to the launch! I managed somehow - with a lot of divine help - to do this in a day. But then came the unknown of submitting it to the publishers, getting the new proof approved through their media, updating the files, putting it through the print-house and dispatching it through the often unreliable British Post. We've been through some tight scrapes over the years in the Openhand Team and I can tell you this pushed us to the limit! But that's the point of such events. The universe is always going to test you on them; they're always an opportunity to confront any inner tightening and expand out. And just like the kestrel - that's what we did! So it was a great evening, and a great way to bring DIVINICUS into being. I just finished the book... Incredible depth with fantastic "story-telling" and guidance. I feel both excited and more at ease than ever... With a deeper sense of acceptance and trust that I am just right where I am...working with and feeling through what arises but letting go of needing to make things happen or to manage my growth and evolution. I feel strongly just how important holding the questions open without needing answers and without stepping in and shaping what I feel needs to happen... Opening and watching and allowing the space for all to come together. This book really solidified that for me. I also feel a huge letting go of needing to evolve in a particular way...ie homo divinicus vs divinicus...I am softening into my striving and efforting. It has also become abundantly clear how much I keep filling the space to avoid the pain of being so utterly "bored"... It's in that space I've known I need to be to break through but have watched myself spinning my wheels to make something that will take it away. Question and maybe you answered in the book and I missed it and I understand if you don't wish to answer here as people are still reading. In the discussion of the group of nine it is mentioned that there is a 10 and 11 outside the group and the purpose of 10 is explained. It says however that they would come back to 11 later. I saw you spoke about galactic alignments with regard to 11... Was there more here? Hi Open. Just wanted to drop in and thank you for the compelling writing. And Trinity for the art and team work. It felt as if the entire book was written just for me:) And the best part is knowing that there are many more who will feel the same. Just --- so very well done, through and through... personally inspirational. Hi Jen - I wrote about the number 11 in chapter 11: "Lucifer, the bringer of Light". Was that not immediately clear? A wonderful evening. Thanks to you all - Open, Trinity, Ben, Lesley and Penny. I could see that you had all put in a lot of effort and it went beautifully. It was good to see the room packed with bods to hear Open speak and expand their minds and hearts. Great to meet old friends too. Trinity's treats were extremely yummy - carrot cake, cashew biscuits, raspberry biscuits and more - I tried a little of each! Thank you Trinity. What an amazing turn out for the book launch. Especially as it was a Monday evening and not at the weekend. So much information to take in, comprehend and absorb. Thank you to the Openhand team for organising the evening so well. Thank you especially to Open for the talk and the book and to Trinity for the magical cover and of course the most delicious cookies. The cashew nut ones were divine! I have just shared the link on Facebook. Thank you so much for this book and the Divinicus program - I feel the timing is perfect (as always) and it is so exciting (as Joanne says) to be part of this - but not underestimating the cross roads that we seem to be at - and what the future may bring. Looking forward to being part of the workshop tomorrow. First, thank you for being here in this time and for sharing all of this wonderful information. I ordered the book through Barnes and Noble here in the US, and to my surprise they shipped it to me on August 23. Now, after reading your earlier comment about the book being reworked just prior to the release date, I'm wondering whether I received the final version. If not, I will certainly order again so I have everything you wanted to share with us. We had quite a rollercoaster upto the release. We submitted the first version which unbeknownst to us, the distributor made available to the bigger online booksellers before we were ready. Then we had our 'holiday', during which, these pretty major realisations happened for me. So yes, there is quite an important change around the situation I feel with Gaia - particularly that she's no need to regenerate the 3D reality here once it has been cleansed; that she doesn't need that 'survival of the fittest' aspect and will move on from it as she continues to draw her energies into the 5D. It does have pretty major implications - assuming I'm right, which I strongly feel I am. This message for humanity is crucial - but my sense is that not very many are ready for it. Still, we'll keep doing the best we can. Thank you Trinity and Open for the quick responses! I have reordered the book through your website, so I will be sure to get the completed work this time. Thank you for letting us know of these changes. I'm very grateful that you took the time and effort to make sure the book now contains the new realizations. I think it'll be interesting to have both versions, so I don't mind our cheeky booksellers! I'm sure there will be some reason it worked out this way. Hi Finch - it's great that you have an open view to it. For me the experience confirmed a key truth: that one's vision of reality must be open enough to be continually evolving. That's why at the beginning I spoke of my perspectives being subjective, 'based on the degree to which one has polished the lens'. Of course no matter how far we've come, there's always more to polish! That said, I'm very confident that I'm very close to what's really going on - close enough to inspires shifts and evolutions within those who read it. And that's what this is really all about. ...or the fastest as U.S. 3rd party sellers would see it? It's good to know that Divinicus is seen as so significant in the publishing world - and I look forward to receiving my copy!! Dear Open, I've started to read this book and just finished chapter 11. I too had an "encounter" with Lucifer 13 years ago now, which took me on my own rocky path into the mud. Although it was different from the encounter you describe earlier in the book, the way you write about the deeper meaning of this fallen angel I find profoundly healing, as I still carry some unanswered confusions around my experiences. Every sentence I read has me calling out YES! and as I mull over your words your clarity continues to fill the gaps in my consciousness and (open) hands me a healthy mirror with which to proceed. from my limited knowledge,Lucifer is called 'The Light Bringer' amongst other names.. is this something to do with confronting our shadow/darker side..and then in conquering 'ourselves'we then become more advanced in a spiritual sense!? Michael(St George)fight the Dragon-Lucifer-Satan... I used to view this 'battle' as if viewing as a 3rd party in something fantastical and external.. but are they all aspects of ourselves that we have to acknowledge and overcome? Whatever I run into in my life, I see in it my own reflections only. For me what is important is what I am experiencing, what is it I am seeing? And I work with that. 3. After that I can spot and work with this energy inside me, as I know there is nothing I pick in the 'outside' world that I don't have inside. So I look and always find that piece inside me, that state of being,and unravel out of it, inside me, by going in, deeper and deeper, step by step, sometimes day by day, sometimes month by month, until I suddenly hit it full on without a drop of resistance. I work with it as with God. It happens a lot to me that I as if speak with God, ask questions, get answers, etc... But it really as if a part of me, of the overall huge field that I am. In a way, I am maybe talking with a more evolved state of mine that creates a potential and pulls me up/forward. Often what happens is that I realize that all I am ever seeing are all sides, parts of one, of one God. I can discover Him through his face (front side) or through his back (the opposite of divinity, anti-God)... two opposite expressions, and it is up to me to decide what I choose to be, and find the way to turn everything into nothing, or, in other words, bring the opposites together until dissolution and resolution of the conflict. This is when it feels as if light goes right into my being, as if some equation is solved, instantaneously... locally, and then the next equation comes. So, Lucifer, to me, is also an expression of divinity, to allow to work with this and that, with black and white, bring them together back to unity (in my consciousness), by unconditional love and full acceptance, transcend the relevant 'parts' of me and bring it all back to unity... let them dissolve back into nothing. So that now I am exactly in the middle, holding two what was before opposites, and now are one, from the point of my center. I have sampled two extremes, and accepted both, felt them full on, so now I can rest in peace in the center in between. And I know I will not fall into extremes anymore, won't get sucked and pulled out by any of these anymore. And there is no fear of any of them anymore (neither light nor darkness). Btw, those who can't accept the dark opposite, can't surely really experience the light, divine counterpart of it. When you reject the dark side (contract from it), you also reject the light side. So you can also say that it is about finding your center in all experiences and expressions of yourself, or of God. Well we've now had the first two events of the World Tour here in our home town of Glastonbury. 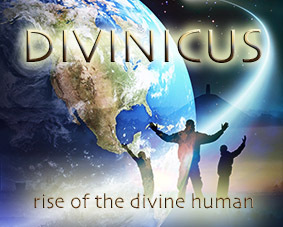 This weekend was the first Divinicus 2day Workshop with a soul-stirring group of passionate, inquisitive and committed beings - what a joy to facilitate! The Openhand work has really come into its own with this new level. It feels like everything we've done thus far, was a preparation for this level of working. It seemed every sharing, every meditation, every energetic shift was aligned with the story we're now revealing. I've always known it was the reason for my incarnation - I just had to find the right energy and words. The timing is perfect. We're moving towards an incredible culmination of this Old World Reality. But we have to appreciate the true depth and magnitude of the illusion the intervention has created, for only then can we truly be liberated. It feels like we've worked ceaselessly for the last 12 years, day after day, night after night, perfecting the energy work, finding the right vocabulary, cell by cell, inch by inch, step by step: all to share a story, in a way that is credible, one that keeps the Gateways through the mind open long enough - a story that's practically beyond the magnitude of many human minds. Yet those who are truly evolving and digging deeply past the surface level, can feel it in your consciousness bubbling to the surface. This weekend was magical, spectacular - I was watching the 'pennies drop' left, right and centre. It always fills me with a great sense of fulfillment and accomplishment. I don't claim to share the absolute truth. It is my truth, gained by the relentless exploration of beingness throughout the eons of my conscious existence. In sharing it with you, it's never about replacing your truth with mine, it's always about activation of your highest reality, your highest sense of being. Look into the mirror I present - what do you see of yourself? Thankyou to an amazing group of souls for your courage and commitment, for your awakeness and openness. Your lives will become increasingly magical as the density of the old world veils continue to get stripped away over time. And so now the World Tour begins in earnest with the Euopean leg of the Tour. I go first to Berlin where I'm working with an advanced group of energy facilitators. Then I'm flying onto Sweden at the weekend to make a key-note sharing at the The Edge Forum run by Openhanders Martin and Per. I'll be giving a full day seminar on the Sunday followed by a facilitator group in mid-week. On the following weekend, I'm leading another Divinicus 2 day workshop in Budapest with our dear 'old' friend Reka. So it's a full on program indeed - I'll have to sleep standing up! I will share here as much as I can from my travels. I welcome you all tuning in. This trip is timed to coincide with major shifts in the field, so come join me through the ether - I welcome your love and support. cos I've got too much life, running through my veins, going to waste..."